Near the lower left corner of this view is the three-petal lander platform that NASA's Mars Exploration Rover Spirit drove off in January 2004. The lander is still bright, but with a reddish color, probably due to accumulation of Martian dust. The High Resolution Imaging Science Experiment (HiRISE) camera on NASA's Mars Reconnaissance Orbiter recorded this view on Jan. 29, 2012, providing the first image from orbit to show Spirit's lander platform in color. A NASA probe orbiting Mars has captured new photos of two dead spacecraft frozen in place at their Red Planet graves. The photos were taken by NASA's powerful Mars Reconnaissance Orbiter (MRO), which has been circling the planet since 2006. The spacecraft first spied NASA's dead Phoenix Mars Lander in the Martian arctic on Jan. 26 in a color photo that reveals the lander and its frigid surroundings as they appeared following Phoenix's second winter on the planet. The Phoenix spacecraft landed successfully on Mars in 2008. In a separate photo, MRO also spotted the three-petal landing platform that delivered NASA's Mars rover Spirit to the surface of the Red Planet in January 2004. The platform used parachutes and airbags to bounce to a stop on Gusev crater so the Spirit rover could begin its mission. In the MRO image, which was taken on Jan. 29, Spirit's lander platform appears as a bright feature at the bottom left, southwest of Bonneville Crater. MRO's High Resolution Imaging Science Experiment (HiRISE) camera has recorded color images of the Spirit rover itself before, but all previous photos of the lander platform were in black and white, according to NASA officials. 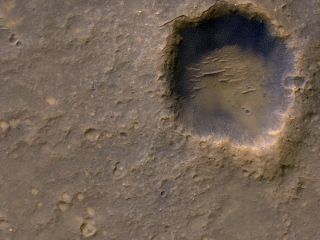 Near the lower left corner of this view is the three-petal lander platform (circled) that NASA's Mars Exploration Rover Spirit drove off in January 2004. Spirit and its twin rover Opportunity were originally designed for three-month missions to look for signs of past water activity on Mars. Both rovers far outlived their warranty, however, and the missions delivered evidence that the Red Planet was once a much wetter, warmer place. Spirit stopped driving when it became mired in sand in May 2009. Mission scientists then converted the rover into a stationary observatory, and Spirit continued to send back data from its trapped location. But, 10 months later, the rover fell silent after being unable to capture enough sunlight on its solar panels over the course of the Martian winter. Still, Opportunity remains alive and well on Mars, and last month celebrated a remarkable eight years on the surface of the Red Planet. After a three-year trek, the intrepid rover arrived at the 14-mile-wide (22-kilometer) Endeavour Crater in August 2011. The rover recently uncovered what researchers say is the best evidence yet for liquid water on ancient Mars. This image, taken Jan. 26, 2012, shows NASA's no-longer-active Phoenix Mars Lander spacecraft after its second Martian arctic winter. The lander has the same appearance as it did after its first winter, as seen in an image from May 2010. This view is from monitoring frost patterns at the Phoenix landing site in far-northern Mars, using the High Resolution Imaging Science Experiment (HiRISE) camera on NASA's Mars Reconnaissance Orbiter. The Phoenix Mars Lander landed in May 2008 on a mission to search and dig for evidence of water in the Vastitas Borealis plains in the Martian arctic. During its nearly six-month mission, the $475 million lander confirmed the presence of subsurface water ice and made valuable characterizations of Martian dirt. The Phoenix mission ended in November 2008 when the spacecraft could no longer receive adequate power due to a combination of dwindling sunlight, light-obscuring dust and harsh winter temperatures. The Mars Reconnaissance Orbiter itself continues to have a prolific career in orbit around the Red Planet. The powerful probe began circling Mars on March 10, 2006 and is currently in an extended phase of its mission. The orbiter continues to provide valuable insights into the planet's ancient environment and how processes such as wind, meteorite impacts and seasonal frosts are continuing to affect the surface of Mars today, NASA officials said. MRO has transmitted more data to Earth than all other interplanetary missions combined.